Have fun on the water again! Having fun on the water can often be ruined when you spend most of the time feeling cold. Leisure time feels much more like leisure time when you’re warm and dry. Here at MV Heating we offer a wide variety of heaters and heater kits that suit many marine craft. We supply both air and water heaters depending on your needs and plenty of upgrade kits and accessories to accompany them. Our MV Airo range are easy to fit, diesel powered air heaters that supply your vessel with warm, dry air with minimal noise output. The MV Hydro range are hot water heaters that can supply your craft with hot water via radiators or matrix heaters to warm up the cabin, or supply it with domestic hot water via calorifiers. 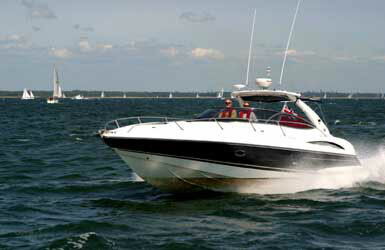 Now you can have fun on the water whatever the weather, with MV Heating. The diagram gives an example of what can be achieved with a hot water system. A hot water system has more control than an air heating system and can also provide hot water for the galley and showers via a calorifier. The addition of screen demisting via high air flow matrix heaters is a great safety feature. 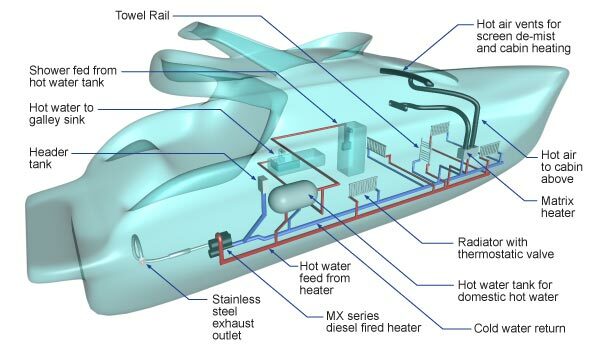 The MV Hydro water heater systems create a real central heating feel in your boat driving out mould and condensation. You can use radiators, towel rails, matrix heaters in any combination all with individual thermostatic control if required. A simple installation on a small sailboat under 9 meters would consist of an Airo 2kw with 2 outlets, one in the saloon and the other in a berth. For larger sailboats we go to the Airo 5kw heater which will power up to 4 outlets. If you require more outlets we go to the kits which have 2 x Airo 5kw Heaters with up to 8 outlets. 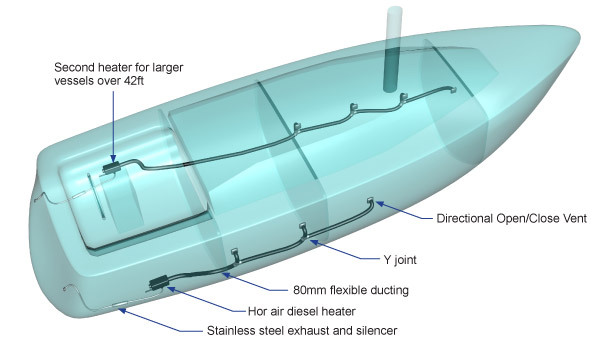 In this case one heater is used to heat the aft of the boat plus saloon and the second heater to heat the forward half of the boat plus saloon.